Strict definitions of treatment targets intend to facilitate strategic acting in routine care and require physicians and patients to discuss and adopt therapeutic changes within distinct time frames, ideally following therapeutic algorithms. This approach has been utilised in many diseases, like diabetes,20 21 hypertension22,–,24 or hyperlipidaemia.25 However, this policy needs to be evidence based to the best possible extent. Here we report on a systematic review of available evidence regarding the effects of treating RA strategically according to defined outcome targets. As a first step, the international steering committee of the Treat-To-Target (T2T) project, comprising a group of expert rheumatologists and a patient (MdW), designed a literature search that aimed at ‘treating to target’-strategy trials in RA. The search was then performed by a project fellow (MS), a control search by a second fellow (RK) and by two mentors (DA, DvdH). The following definitions were made: (1) strategy trial – clinical trial of any RA drug treatment, in which a clear outcome target was the primary end point and therapeutic consequences of failing to reach the target were predefined; (2) targets – a target could be formulated by clinical, serological, patient-reported, functional, or radiographic variables; individual measures (eg, joint counts or acute phase reactants), composite scores (eg, disease activity score or simplified disease activity index), or response criteria (eg, those defined by the American College of Rheumatology (ACR) or the European League Against Rheumatism) were considered alike; (3) outcomes – Clinical, functional, serological and/or radiographic changes, as defined in the respective trials, were compared between treatment groups. We searched Medline, Embase and Cochrane databases from their inception until December 2008. Additionally, ACR and European League Against Rheumatism (EULAR) abstracts of 2007 and 2008 were screened. The search was limited to humans, adults and the English language. Detailed inclusion and exclusion criteria and the list of search strings are shown in supplementary tables (tables S1 and S2). We did not exclude studies based on quality. From the identified strategy trials, data were extracted concerning definitions of targets and success rates of applied strategies. Flow chart of the systematic literature search. Illustrated are the results of the initial search and the selection process of abstract screening, full text review and hand search. AB, abstract; ACR, American College of Rheumatology; EULAR, European League Against Rheumatism; RA, rheumatoid arthritis. Only four trials had randomised patients to a targeted treatment algorithm versus routine care. In Tight Control of Rheumatoid Arthritis (TICORA),26 treatment of early RA aimed at low disease activity (LDA) by Disease Activity Score (DAS), comparing DAS-driven treatment adaptations upon monthly assessments with 3-monthly routine care. Computer Assisted Management in Early Rheumatoid Arthritis (CAMERA)27 aimed at remission of early RA, comparing monthly treatment adaptation by computerised decision if >20% (50%) reduction of several variables was not attained with 3-monthly routine care. A cluster randomised trial by Fransen et al 28 compared the proportion of patients reaching LDA at the end of follow-up and the number of disease-modifying antirheumatic drug (DMARD) changes during 24 weeks (co-primary end points) in outpatient centres using systematic, DAS28-steered treatment protocols with centres providing routine care. The treatment decision in the DAS28-driven group depended on a threshold of 3.2, indicating LDA. Finally, Symmons et al29 tested the effect of aggressive versus symptomatic therapy on physical outcome (Health Assessment Questionnaire (HAQ)) in established RA. Decisions for treatment adaption were driven by joint count- and C reactive protein (CRP) thresholds. Designs of these trials are depicted in figure 2; baseline characteristics are tabulated in supplementary table S3. Design of the seven core clinical trials. (A) TICORA study (Grigor et al 2004)26; (B) CAMERA study (Verstappen et al 2007)27; (C) Fransen et al 200528; (D) Symmons et al 200529; (E) Edmonds et al 2007 (abstract)31; (F) van Tuyl et al 200830; and (G) Stenger et al 1998.32 Intensive and routine treatment arms are displayed, red arrows mark the scheduled intervals for target assessment. Table 1 specifies the targets of trials A–G. AZA, Azathioprine; CAMERA, Computer Assisted Management in Early Rheumatoid Arthritis; CRP, C reactive protein; DAS, Disease Activity Score; DMARD, disease-modifying antirheumatic drug; HCQ, hydroxychloroquine; IFX, ifosfamide; LDA, low disease activity; LEF, leflunomide; MTX, methotrexate; NSAID, non-steroidal anti-inflammatory drug; sc, subcutaneous; SJC, swollen joint count; sod., sodium; SPZ, sulfinpyrazone; TICORA, tight control of rheumatoid arthritis. Characteristics of the core trials, including treatment targets and visit intervals, as well as clinical, functional and radiographic outcomes are summarised in table 1 and will be detailed below. Significantly greater DAS reduction and higher likeliness to achieve remission following intensive disease management was evident in all four trials. In TICORA,26 the primary end point, EULAR good response, as well as DAS remission were significantly more frequent upon intensive than routine care. CAMERA27 showed significant benefits of targeted treatment regarding its primary end point, remission for 3 months. Fransen et al28 showed that both the proportion of patients reaching LDA and frequency of DMARD changes during follow-up favoured a DAS28-driven DMARD strategy. Symmons et al29 found significant differences in clinical outcomes in the evaluator global assessment, while other measures, including joint counts, erythrocyte sedimentation rate and patient global visual analogue scale, were not significantly different. Physical function was the primary outcome in the trial by Symmons et al29; the intensive group failed to show significant differences compared to routine care regarding HAQ changes. Also CAMERA27 did not show significant differences in functional outcomes. Grigor et al26 reported significantly less progression of radiographic changes26 in the intensive treatment group. In contrast, no significant differences in annual radiographic progression were described in the CAMERA study.27 Two of the studies did not report radiographic data28 29 (table 1, figure 2). van Tuyl et al30 presented a study protocol randomising early RA patients to different targeted and tight monitoring schedules: one group aiming at DAS28 remission, the other at suppressing cartilage degradation as assessed by measuring urinary C-terminal cross-linking of type II collagen. Results did not differ significantly between the two groups with similar overall remission rates in both arms (figure 2, table 1). However, as the authors concede, this was a very small pilot study. Similarly, Edmonds et al31 reported in abstract form on steering at normal CRP levels versus a joint count targeted approach. Their results suggested that targeting CRP provides better interference with radiographic damage (table 1, figure 2). Stenger et al32 compared an aggressive treatment protocol that stipulated change of DMARD therapy if after 8 weeks CRP decrease was less than 50% in patients with a high risk of developing aggressive disease; the comparator arm on regular therapy was a retrospectively assessed group of high risk patients. After 2 years, the area under the curve for CRP was significantly lower in the intensive treatment group than in the historic control. While no functional data were provided, the reported radiographic progression favoured the intensive treatment (table 1). 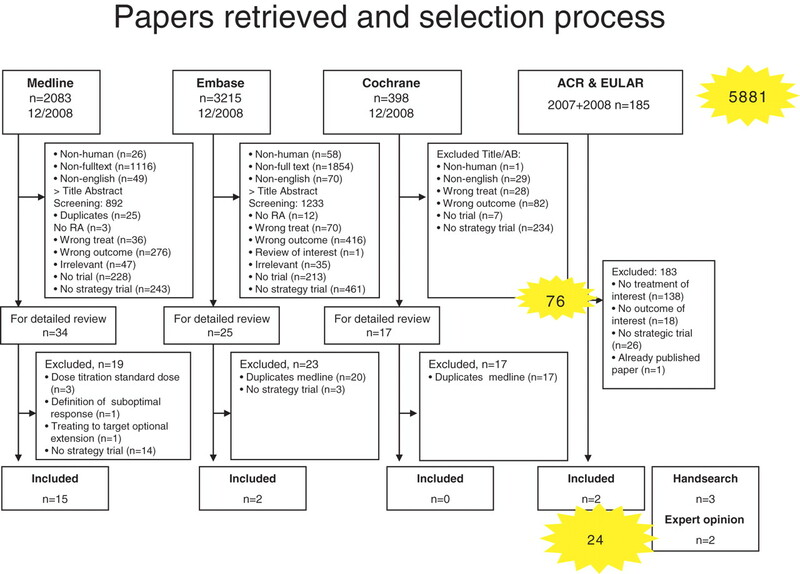 A number of studies used the treat to target concept, but, in contrast to the mentioned papers, did not have a non-targeted control arm, since all arms pursued the same target with different treatment sequences (supplementary table S4). Likewise, several trials compared step-up with combination regimes, dose titration of agents or different therapies to reach a defined target without directly addressing the efficacy of treating to target. A description of these studies can be found in the supplementary material accompanying this manuscript. Utilised targets showed considerable heterogeneity (table 1, figure 2). Among the randomised trials comparing targeted versus routine approaches, three out of four employed state targets,26 28 29 an approach that has been favoured as being more appropriate than assessing changes from baseline.35 Only in CAMERA,27 the target was formulated as reaching defined improvement criteria. Also, visit intervals were noticeably heterogenous: clinical assessments were performed from monthly26,–,28 31 to every 429 36 months. Two trials randomised patients to different visit intervals.26 37 In both, patients assigned to intensive strategy were seen monthly, those in routine care every 3 months. In conclusion, only few studies have used a randomised approach to test the value of treatment to a specific target. However, all of them provided compelling evidence of clinical benefits of such an approach. However, more data are needed concerning radiographic and functional outcomes and patients with longstanding RA have not been sufficiently investigated.
. Prediction of progression of radiologic damage in newly diagnosed rheumatoid arthritis. Arthritis Rheum 1995;38:1466–74.
. Long term course and outcome of functional capacity in rheumatoid arthritis. The effect of disease activity and radiologic damage over time. Arthritis Rheum 1999;42:1854–60.
. High anti-cyclic citrullinated peptide levels and an algorithm of four variables predict radiographic progression in patients with rheumatoid arthritis: results from a 10-year longitudinal study. Ann Rheum Dis 2008;67:212–17.
. Relationship between time-integrated C-reactive protein levels and radiologic progression in patients with rheumatoid arthritis. Arthritis Rheum 2000;43:1473–7.
. Eight versus 16-week re-evaluation period in rheumatoid arthritis patients treated with leflunomide or methotrexate accompanied by moderate dose prednisone. Rheumatol Int 2007;27:975–9.
. A proposed treatment algorithm for rheumatoid arthritis: aggressive therapy, methotrexate and quantitative measures. Clin Exp Rheumatol 2003;21(5 Suppl 31):S209–10.
. Early rheumatoid arthritis: strategies for prevention and management. Best Pract Res Clin Rheumatol 2007;21:27–42.
. Remission of rheumatoid arthritis: should we care about definitions? Clin Exp Rheumatol 2006;24 6(Suppl 43):S–45–51.
. Measuring disease activity for rheumatoid arthritis. Z Rheumatol 2006;65:93–6, 98–102.
. Outcomes in rheumatoid arthritis: incorporating the patient perspective. Curr Opin Rheumatol 2007;19:101–5.
. Follow-up standards and treatment targets in rheumatoid arthritis (RA): results of a questionnaire at the EULAR 2008. Ann Rheum Dis 2010;69;575–8.
. Defining success in diabetes disease management: digging deeper in the data. Dis Manag 2008;11:119–28.
. Achieving glycosylated hemoglobin targets using the combination of repaglinide and metformin in type 2 diabetes: a reanalysis of earlier data in terms of current targets. Clin Ther 2008;30:552–4.
. Usual versus tight control of systolic blood pressure in non-diabetic patients with hypertension (Cardio-Sis): an open-label randomised trial. 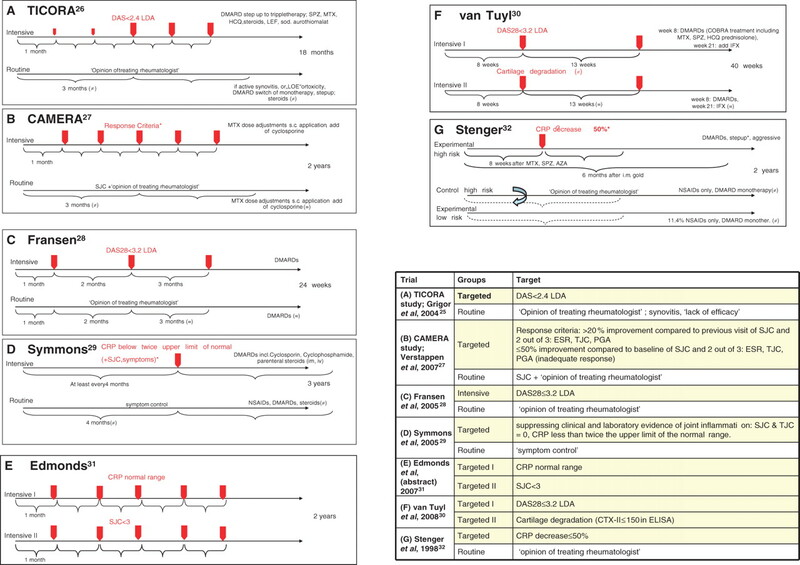 Lancet 2009;374:525–33.
. Treatment blood pressure targets for hypertension. Cochrane Database Syst Rev 2009;3:CD004349.
. The optimal target blood pressure for antihypertensive treatment in Japanese elderly patients with high-risk hypertension: a subanalysis of the candesartan antihypertensive survival evaluation in Japan (CASE-J) trial. Hypertens Res 2008;31:1595–601.
. Treating to target patients with primary hyperlipidaemia: comparison of the effects of ATOrvastatin and ROSuvastatin (the ATOROS study). Curr Med Res Opin 2006;22:1123–31.
. Effectiveness of systematic monitoring of rheumatoid arthritis disease activity in daily practice: a multicentre, cluster randomised control trial. Ann Rheum Dis 2005;64:1294–8.
. Tight control and intensified COBRA combination treatment in early rheumatoid arthritis: 90% remission in a pilot trial. Ann Rheum Dis 2008;67:1574–7.
. Objectives study in RA (OSRA): a RCT defining the best clinical target for disease activity control in RA. Ann Rheum Dis 2007;66(Suppl II):325.
. Early effective suppression of inflammation in rheumatoid arthritis reduces radiographic progression. Br J Rheumatol 1998;37:1157–63.
. Factors predicting response to treatment in rheumatoid arthritis: the importance of disease duration. Arthritis Rheum 2000;43:22–9.
. Daily practice effectiveness of a step-down treatment in comparison with a tight step-up for early rheumatoid arthritis. Rheumatology (Oxford) 2008;47:59–64.
. Tight control in the treatment of rheumatoid arthritis: efficacy and feasibility. Ann Rheum Dis 2007;66 (Suppl 3):iii56–60.